Computing optical flow between any pair of Internet face photos is challenging for most current state of the art flow estimation methods due to differences in illumination, pose, and geometry. We show that flow estimation can be dramatically improved by leveraging a large photo collection of the same (or similar) object. In particular, consider the case of photos of a celebrity from Google Image Search. Any two such photos may have different facial expression, lighting and face orientation. 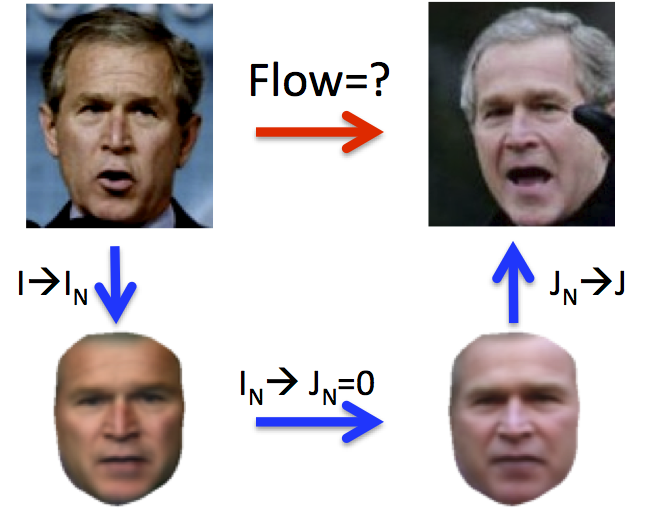 The key idea is that instead of computing flow directly between the input pair (I,J), we compute versions of the images (I',J') in which facial expressions and pose are normalized while lighting is preserved. This is achieved by iteratively projecting each photo onto an appearance subspace formed from the full photo collection. The desired flow is obtained through concatenation of flows (I-->I') (J'-->J). Our approach can be used with any two-frame optical flow algorithm, and significantly boosts the performance of the algorithm by providing invariance to lighting and shape changes.